All transactions are safe and secure with a reliable history in online purchasing behind each of our associates. 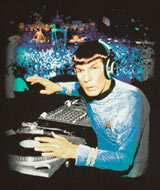 Buy the DJ Spock t-shirt to own Star Trek clothing and merchandise. Mister Spock might seem a little uptight at times, but he still knows how to have a good time. This eye catching shirt features the Star Trek character playing the role of DJ to a crowd of fans. As the science officer aboard the USS Enterprise, he is bound to know how to drop an impressive techno beat. This creative Star Trek t-shirt design will surely get a few chuckles from fellow fans and gawkers alike. Make sure to pick up this tee to show off your sense of humor as you rock out to DJ Spock. In addition to the DJ Spock tee above, browse the Star Trek Clothing Gallery for more apparel like men's and women's clothes, kids shirts or hoodies.